Wappingthorn Court – verdant opulence for a Sussex country house. 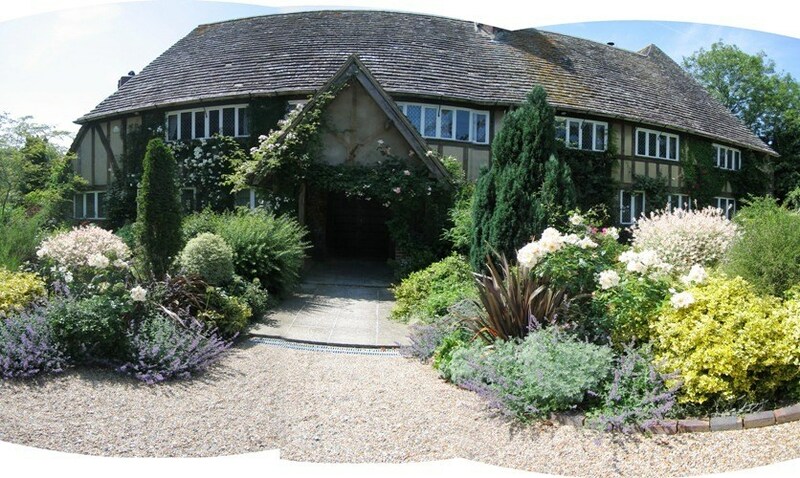 When these clients contacted us, they had recently moved to this beautiful, traditional country house. In its vernacular style, with some elevations completely in flint with brick quoins, others with oak-framed uppers, it is both charming and impressive. Sadly, its gardens had an air of austerity and neglect, and the clients wanted radical change. 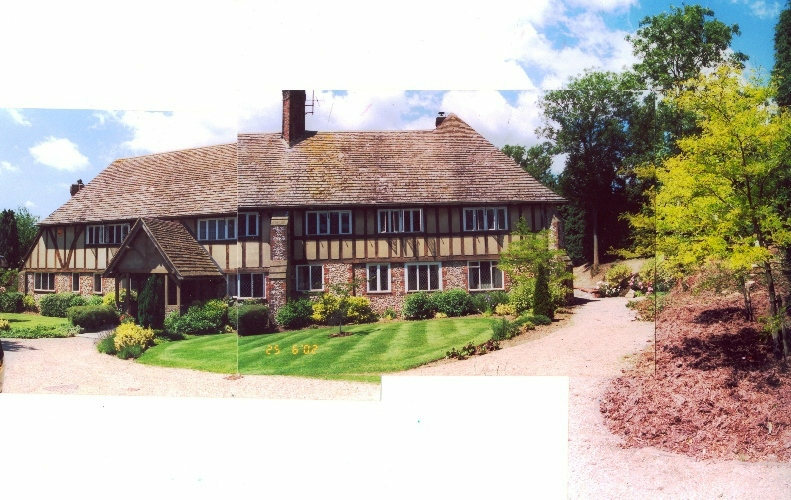 This case study shows the progress of the scheme in four important areas – the front, the terrace, the garage block and an apron to the north of the house. Some of our sketches are included to illustrate the working method we adopted here. Most of all, we hope that you will agree that the end result is a garden that greatly enhances the house, softening it and adding to its sense of romance. At the front, we ensured that there would be flowers in abundance, with something beautiful to look at every day. And the rear terrace provides an excellent setting for entertaining that cleverly creates intimacy in a large space, whilst making the best of an excellent location looking to the South Downs. 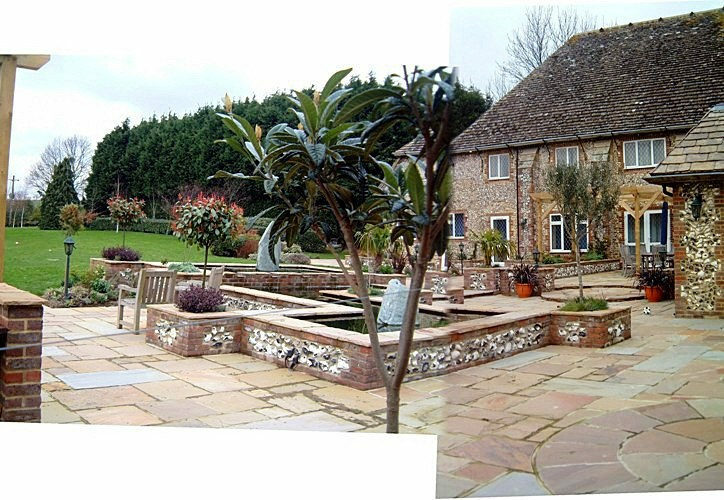 Both of our clients were heavily occupied with the internal remodelling of the house, and we quickly recognised that they would prefer to entrust the detail of hard landscaping design, its planting and execution to us. The clients did have very clear objectives for the scheme, and, naturally, they wanted to be sure that we would meet their requirements. 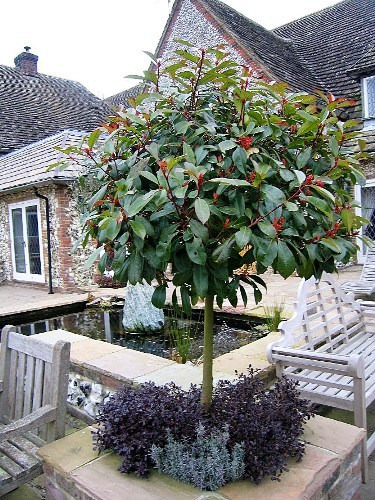 We therefore agreed that we would avoid burdening them with long lists of plants or planting plans. 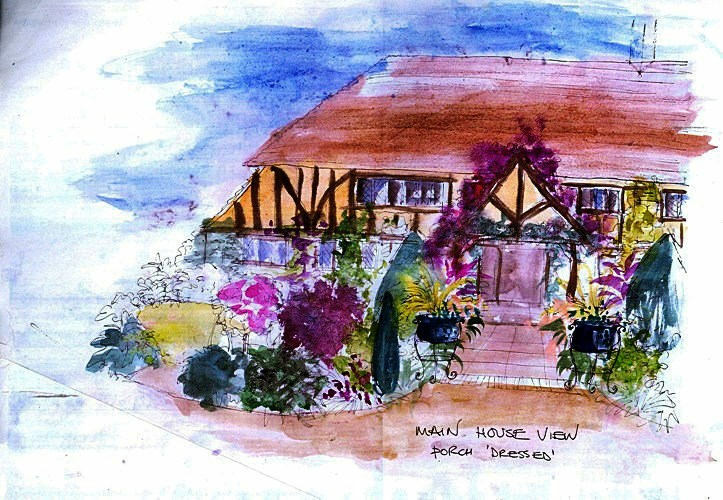 Instead, we would produce fast, but accurate, hand-drawn sketches that would allow our client to see at a glance in pictures how the house and garden would look. This made for a productive and economical dialogue about the most significant choices, which made the best use of our clients’ time and allowed us to keep our costs down. After: the front of the house. Just one year after our work, the house and its new garden are in complete harmony, with a grace and presence that the fine house simply could not achieve on its own. The front: the approach as we found it. The gardens were bare, austere and monochrome. 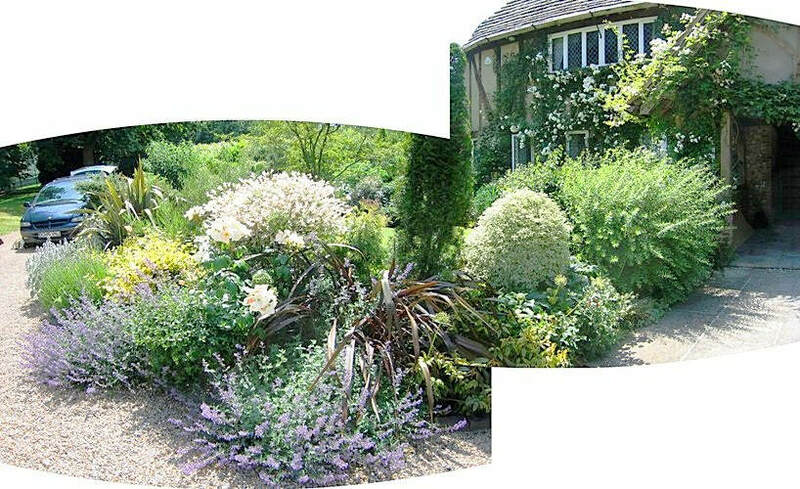 The existing plants were tired and had been pruned in a blocky style that neither brought them to their best condition, nor complemented the house. The front: the proposed design seen from the approach. 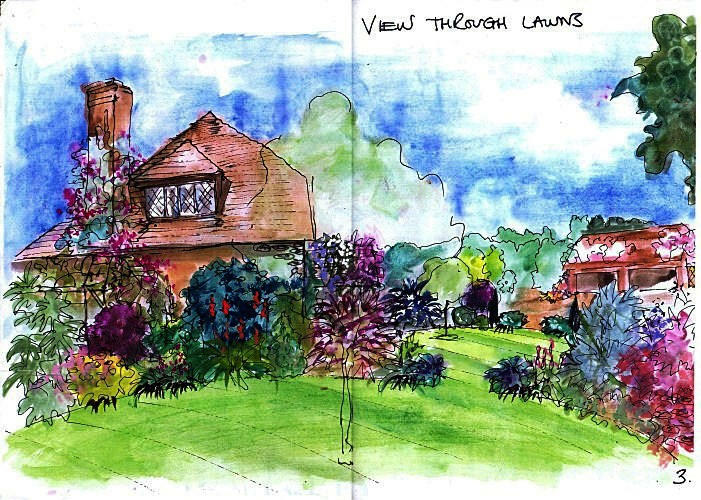 Our clients were able immediately to get a strong sense of how the finished garden would look from our presentation of sketches like this. Around them, we were able to explore easily what features the client liked or disliked about, say, the shapes, colours and style of the new beds, and to refine the design accordingly. The front: the new beds in the approach, formed and just planted. The new beds are shapely and colourful (even in winter) and the design invites the visitor to stroll through to the next area. 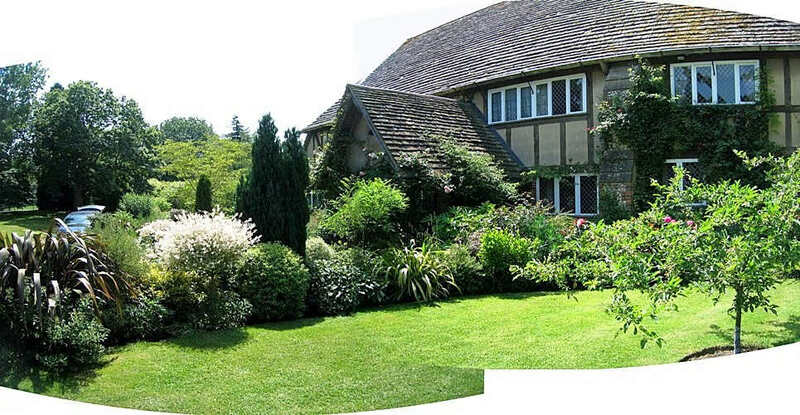 The plants wrap around the lawn and softly dress the beautiful house. The front: a view of the main frontage as we found it. 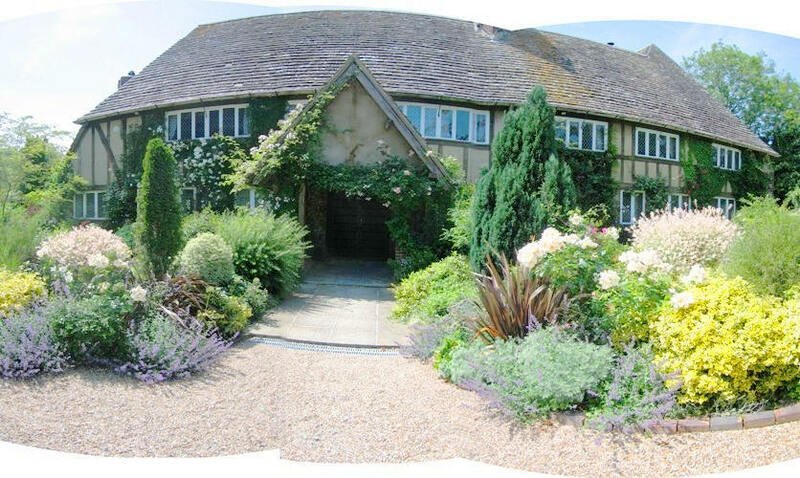 The long frontage of this substantial house simply overwhelmed the existing garden. The absence of any flowers or interesting shapes made matters worse. In our view, some big, blowzy, flowering things were needed to restore the balance! The banks to the right in the photograph were particularly dry, so we applied manure copiously to get the soil into shape for planting. 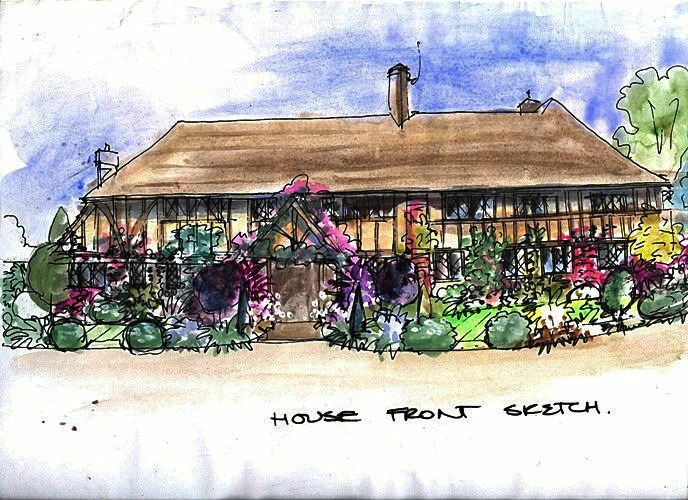 This sketch gave our clients a clear glimpse of the future. 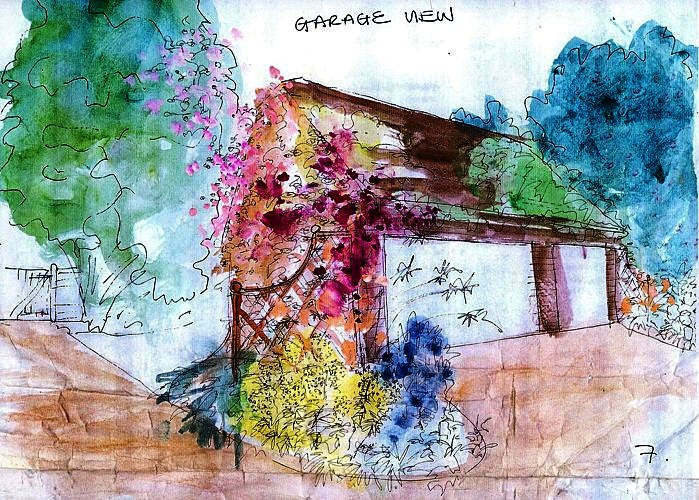 They were very enthused by the strength of the design and how it would blend house and garden into something much more than the sum of the parts. The front: side beds just planted. The sweeping side beds have just been cut-in and planted, but the attractive shapes already improve the overall look of the frontage. Even in the first year, the shapes and forms are clearly established, and variety and colour are strongly apparent. Nothing bleak about mid-winter here! This most important part of the design deserved extra attention at the design stage. The front: beginning to mature. 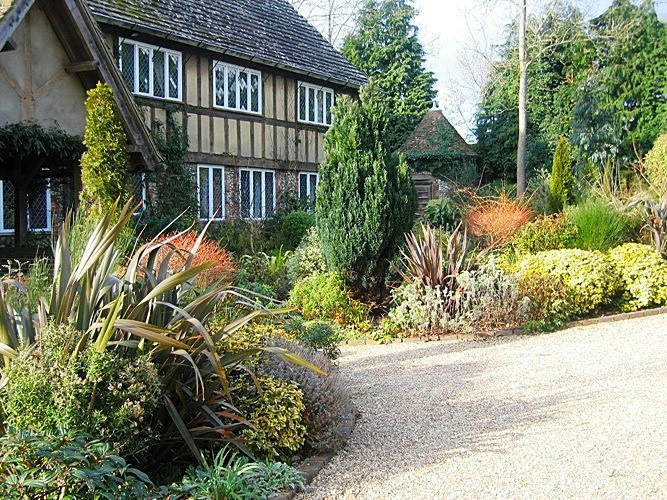 The soft planting is pretty and voluptuous, lending an inviting warmth to the house. In all seasons, there is always something interesting to see, whilst beguiling scents add an extra dimension. We picked up the curve of the existing beds and added a structured edge of bushes and shrubs - architectural and colourful. Their warm colours look beautiful all year around and they are straightforward to maintain. 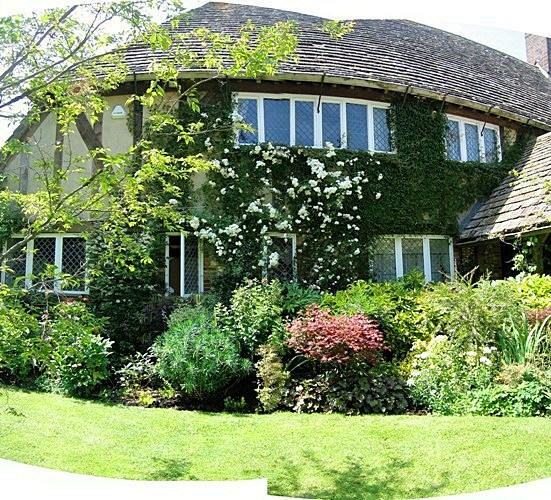 Flowers prettily frame the house in ever-evolving patterns as the year progresses. The front: a beautiful, well-dressed house. In the summer sunshine, flowers tumble softly and the light picks out fetching shapes in the shrubbery. The house and garden already look like they have been nestled together “for ever”. The terrace: design agreed, construction underway. The old terrace at the rear was a large space, but it was flat and uninteresting, exposed to the weather and an uninviting place to sit and dine. Our task was to make this key area comfortable and intimate, whilst enhancing its usefulness and making the most of the fantastic views of the lake in the grounds and of the South Downs beyond. 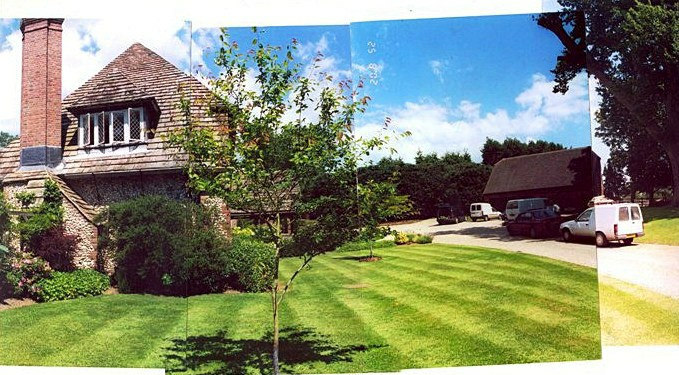 The photograph shows the setting-out markings on the lawn for the new ponds, terracing and plant beds. The terrace: hard landscaping completed, just planted. 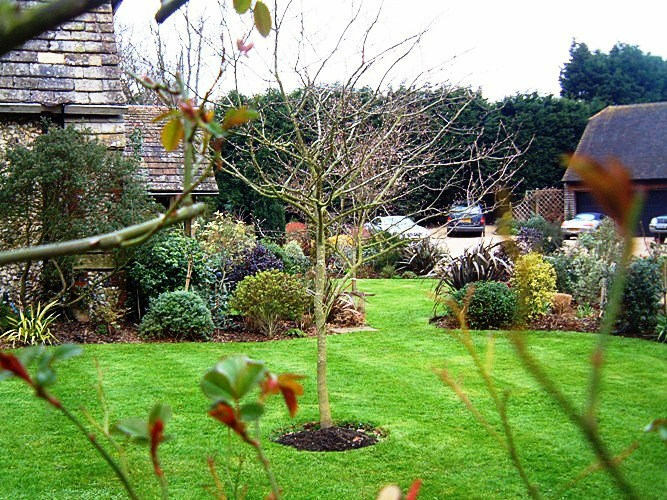 Our clients wanted a lush, almost tropical feel, which we achieved by careful planting. This also allowed us to sub-divide the large, paved area to create the necessary sense of intimacy. The terrace: lush yet intimate. 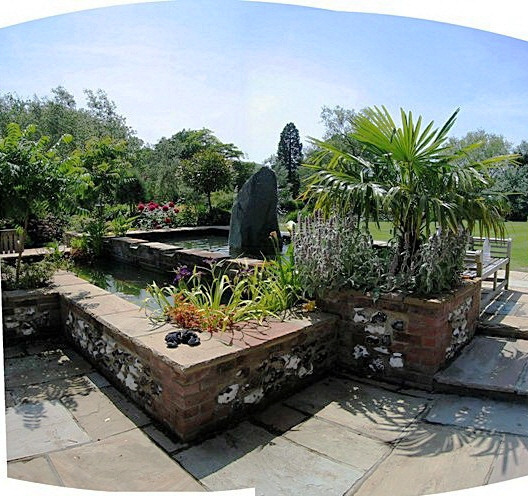 We placed raised beds around the formal ponds, designed to hold carefully chosen trees, combined with under-planting. The end result provides height without obscuring the views, and adds colour and softness to complement the formal angularity of the stone and brick. The terrace: expansive and exotic. The plants have grown and filled their squares at the corners of the pool, spreading over the hard edges, flowing gently. They wrap elegantly around the terrace, giving tantalising glimpses of the magnificent view beyond. 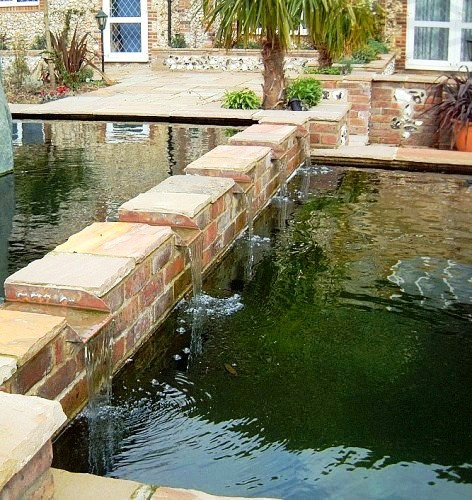 The raised pond was designed with stepping stones along its middle. The Indian sandstone slabs are continued along the pond’s perimeter to make informal seating, creating sociable areas around the terrace. The water reflects the house’s beautiful flint walls. 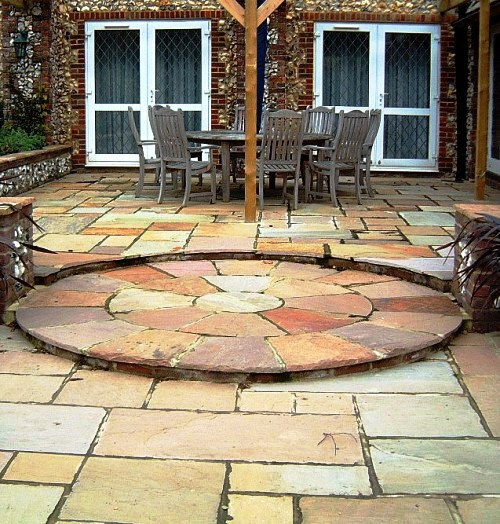 The shrubs planted around the raised pond harmonise with the colours of the slabs and the timber furniture. The raised pond lip also serves as informal seating. Overall, this is a wonderful terrace for relaxing and socialising. The almost rustic slab work shows off the beauty of the sandstone and contributes to the sense of intimacy of the terrace. 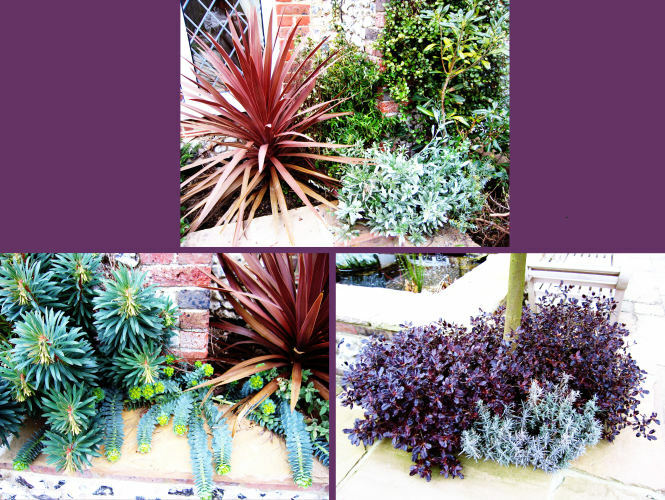 Shapely, colourful plants make a dramatic foil to the sandstone, flint and brick. The garage: a softer feel. The large bulk of the enormous garage block needed softening, so we designed trellis to sit at the sides, dropping away in graceful curves. We planted vigorous climbers, such as Wisteria, Akebia, and Solanum jasminoides, that would grow quickly on the south-facing surface. They now bask in the sunshine, minimising the visual impact of the huge expanse of roof. Exceptionally poor, dry soil under mature conifers made this area very difficult. No plant species could tolerate this environment. However, it is overlooked by the house’s main guest suites so it is an important view. We proposed a novel solution. The north apron: just planted. We built a raised trellis, covering the entire area and lying at just the right angle to present the plants to daylight and to maximise their appeal to the eye. 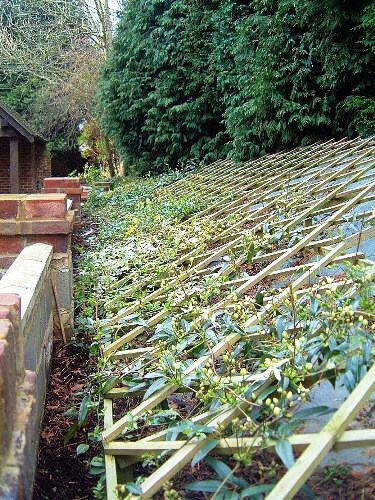 Underneath the structure, we laid a membrane completely to exclude weeds on the sloping ground beneath. We planted vigorous evergreen climbers, capable of generously filling the space, in combination with scented and abundant roses in deep pockets of improved soil right at the base of the wall. Along the edge of the plot we laid a simple, low-cost irrigation system, designed to deliver water exactly where the plants needed it, to aid their establishment, whilst minimising waste. This was operated by the gardener, so that, say, while he mowed the lawns, the young plants were watered thoroughly. Now they are established, this regime is no longer necessary.